went to the bayou - Lake Houston Fishing! 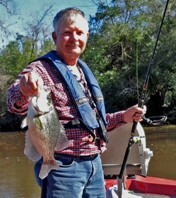 today just can not seem to get out of the bayou for all of the fish biting there. think he had been catching on blue also . He said he only had one hit at the time. lip and was breaking loose as i tried to swing them aboard in stead of getting the net under them. finished the day with 21 keepers in the boat . Had 7 fish of the 21 that were 15 inches or over. fish to be had in the bayou. Water clearing back to old houston color. Moving from Pasadena to Humble soon and plan on seeing you on the lake. wish i could get a few of those weights now. do you think the Trinity River PCB's will help the Crappie get bigger??? Sorry, I couldn't help it.